This is not a picture of The Welcome, but it`s a photo taken by Megan Parr from her home on Sailor`s Encampment on St. Joseph Island in July 2011. If you have any information about this ship, please contact us! 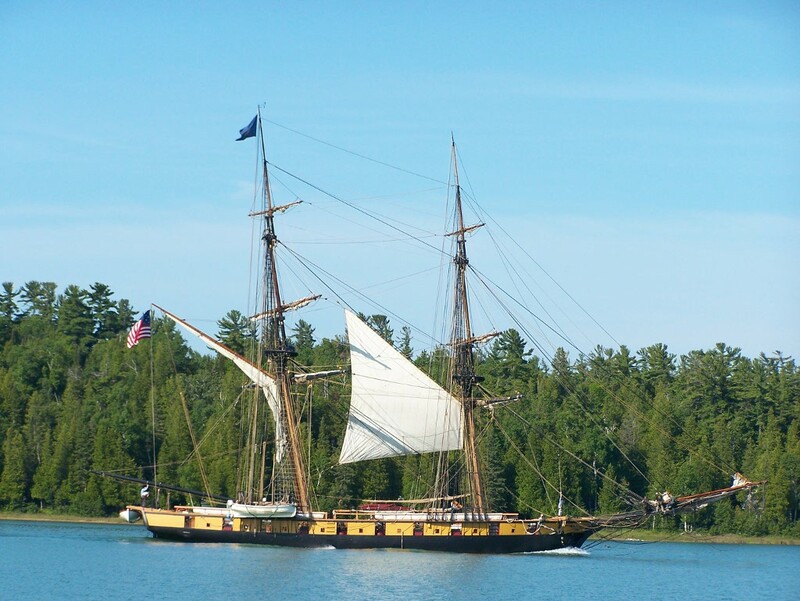 A replica of the first armed sloop on the Great Lakes, “The Welcome”, will be docking at the Richards Landing Municipal Arena from Sunday, July 15 to Wednesday, July 18th. You can meet the crew and tour the deck between the hours of 10 a.m. to 4 pm and 6 pm to 9 pm (Tuesday is 6 pm to 9 pm only). Kids under 12 are free, and adults are $7. We think it would be apropos for you to pick up a bag of our Ship & Anchor coffee or our new Peace Blend while you are visiting! What is “The Welcome”, you ask? Or, maybe you’re asking, “What is a sloop?”. 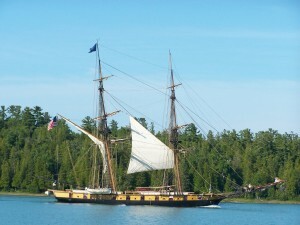 Simply put, a sloop is a type of sail boat. I tried to get a more specific definition from Wikipedia, but all the sail boat speak was really above my head. From the information I did glean, The Welcome is a sloop-of-war, i.e. it is armed. In fact, The Welcome is a replica of the ship ordered by the son of John Askin, and it was used to bring in supplies to Fort St. Joseph. For more information on the War of 1812 commemoration events, click here. For more information on The Welcome click here.